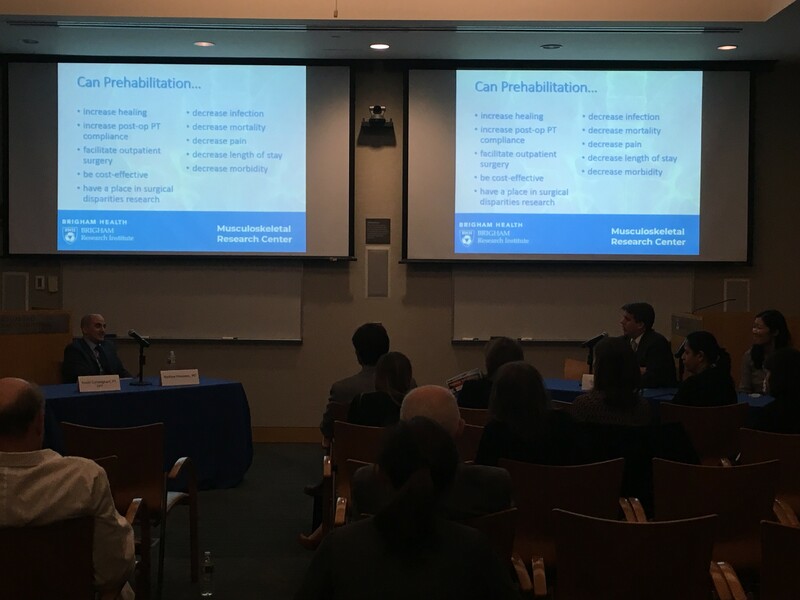 On Thursday, April 12th, the Musculoskeletal Research Center hosted an interactive workshop to highlight the physical and medical interventions associated with prehabilitation, identify issues that reduce recovery and discuss research opportunities to address these issues. It was a coming together of common interests in which faculty from various disciplines, departments, and divisions offered a variety of perspectives lending to the knowledgeable and collaborative nature of the presentations and subsequent conversations. The event consisted of three sessions: physical prehabilitation, medical prehabilitation, and research brainstorming around preadmission interventions to improve orthopedic outcomes. Each session was comprised of a series of short presentations that were followed by a panel discussion, and Dr. Thomas Thornhill moderated a lively discussion that was well-received by the audience. Dr. Thornhill posed many thought-provoking questions that called to action the betterment of patient care from a research perspective. The speakers readily engaged with the audience, considering innovative ideas for proactive interventions, from all disciplines, with the goal of ensuring a higher quality of life and positive outcomes for the patients we care for at Brigham and Women’s. Ensuing conversations made it clear that prehabilitation may also lead to reduced hospital costs. Dr. Matthew Mossanen emphasized this potential benefit, presenting a strong argument for increasing awareness, as well as a collective research effort, around this specific theme. As a results-oriented institution, workshops such as these are highly beneficial for networking with experts in the field and fellow colleagues, in a hospital-wide effort to create the best experience possible for patients, practitioners, and researchers.